Well 2017 has been a different kind of year for me. I’ve started my own business, set up a website, helped to moderate a 16,000 member woodworking group on Facebook, designed and built new things, developed new skills and techniques, bought new tools, made lots of bags of wood shavings and found numerous ways around problems – mostly ones that I created! Craft fairs have been an eye opener for me, I’ve only had tables at 2 this year as I want to grow my business slowly and learn and develop as I go, rather than jump straight in and fall flat on my face! The first one was a bit of a taster as it was at my daughter’s summer fair at school– it was ok, a few sales and lots of good feedback, but nothing too impressive. I did make a few sales following the fair too from handing out business cards. 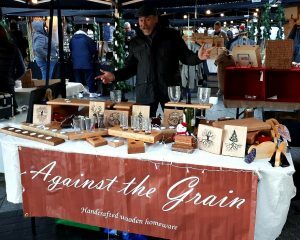 The other fair I did was an outdoor makers market in Manchester at the end of November, which happened to be one of the coldest days of the year! The sleet started as my wife and I were setting up and didn’t stop until after we got home. It was a cold and miserable day with very few people walking around outside – and who could blame them! So very poor from a sales point of view, but we did learn a lot from it, such as; different ways of displaying the goods on a small table (less is definitely more here). What to wear in awful weather conditions (luckily there was an outdoor shop in the mall, where I could buy extra socks and thermals). We also had a chance to talk to some of the other stall holders, which was great to be able to pick their brains on different ways of doing things and what they recommend we did to improve etc. I also decided that I want to make my products a little more unique and different from anything else that I’ve seen in shops or by other makers. So I’m teaching myself some leatherwork and trying to incorporate it into my work, luckily I can already sew reasonably well, but it’s entirely more difficult in leather. And of, course this requires lots more tools and things to make in itself. My sister generously designed and set up my website for me, whilst juggling her own family and business. I’m slowly learning to do more on it the more I use it, but I’m still convinced that I’m going to accidently delete the entire internet if I’m not careful! So she still gets regular texts and phone calls asking for help and advice on it as well as requests to ‘tweak’ it slightly (and by tweak, I really mean redesign half of it) but I’m getting there slowly. I’ve spent a far too much money on new tools and wood to create some pieces that I’m really proud of and a fair few that found their way into the chimenea rather than my sales page. Although with each new piece I make I learn something or refine a technique and develop, so I feel none of it has been completely wasted, even the mistakes. Woodworking UK deserve a special mention as 16,000 people actively talking about and sharing their projects, discussing lots of man glitter related things really helps with ideas and techniques. Plus it’s just a nice place to relax and chat with like-minded people. The admin team deserve their own mention as between 13 of us we moderate the page, but also have our own chat group on messenger which is as busy, if not busier than the actual page! All of them have a passion for woodworking and are the most helpful bunch I’ve ever come across. They have guided me where I’ve failed and pushed me to do better than I ever thought I could as well as royally taking the Mick when I deserved it! Most of all this year I think I’ve learnt how supportive my family are of me and how much my wife is behind me, offering advice and help, including spending her well-earned time off freezing and smiling at potential customers! I think my New Year’s resolution shouldn’t be to eat more healthily or drink less or go to the gym more often – it should be to thank the people that offer their help freely and support me in a million different ways all year round. So to all my customers, my friends, family, WWUK and especially my lovely Wife. Thank you for a great year and can’t wait to see what 2018 brings us all! An inspirational read….thanks for sharing enjoy Christmas and I hope 2018 is an awesome year for you and the business. It’s nice to know you got something from it. Inspiring wasn’t what I imagined anyone would say about me, but glad it helps. We’re not building Rome, but it sometimes feels like as much effort when working full time and having a family too. If we keep at it then I’m sure we’ll get were we want to! Many thanks Tim. Fingers crossed. What a refreshing read. Many others out there wishing and hoping it will happen to them. If they read this it may inspire. Good luck for future work and sales. Thank You Jez, glad you enjoyed it and yes, hopefully somebody will be inspired to try something new and go out on a bit of a limb, so to speak! 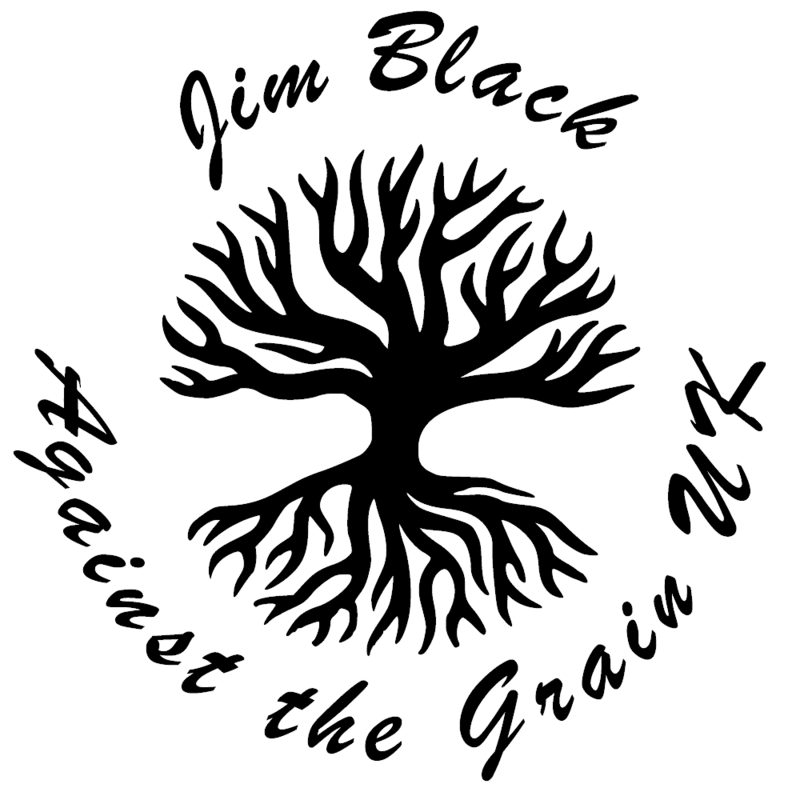 What a great blog Jim, it sort of sums up this year for me too, including sticking half of what I make into the wood burner, but the learning is worth it. I have also just finished my first market and was amazed at what people bought, and what they did not buy! I hope you have a good Christmas break and like you I am looking forward to making more man glitter in 2018. Can’t wait for next year to really start to push things along! Well done Jim, and thank you for sharing your inspirational, motivating words. Never thought I would be motivational!